Game show returns to Los Angeles. If Los Angeles is seeing a boost in production recently, city leaders ought to send a thank you note to Steve Harvey. As first reported by the Atlanta Journal-Constitution’s Rodney Ho, Family Feud is leaving Atlanta to return to Los Angeles, where it left eight years ago when Steve Harvey became host of the now top-rated syndicated game show. The last time the syndicated version of Feud taped in Los Angeles was during the 2009-10 season, when John O’Hurley was host. When Steve Harvey assumed hosting duties in 2010, the series shifted production to Orlando, then to Atlanta shortly thereafter. Set to take place in August, the move is a boon to the Los Angeles area, which it and California in recent years has seen “runaway production” to Canada and to other states, specifically Georgia, lured by tax credits. Several years ago in an odd move at the time, now-defunct courtroom show Swift Justice switched locales from Atlanta to Los Angeles after Nancy Grace departed the series. The series relocated because the new judge wanted an easier commute to L.A. from her home in Las Vegas. Before relocating to Orlando and Atlanta, and excluding a short period in 1993 where it was taped in Nashville at OprylandUSA, Feud has always taped in L.A., from ABC Television Center to Tribune Studios and other places. Feud is returning to CBS Television City in Hollywood, where it was taped during the Ray Combs era. 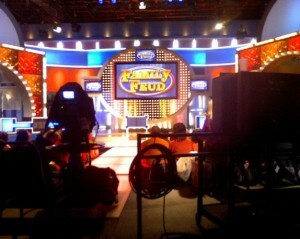 Already, ABC’s Celebrity Family Feud tapes there, at the Bob Barker Studios. Meanwhile, the facility Feud tapes in Atlanta is expected to be either redeveloped or torn down. The move wasn’t unexpected as Steve Harvey is consolidating his projects in one metro area. Currently, he’s starring in four TV shows shot in Los Angeles: in addition to Celebrity Feud, he stars in ABC’s Steve Harvey’s Funerdome , NBC’s Little Big Shots, and spin-off Little Big Shots: Forever Young, and of course, his daily talk show. The only exception is Fox’s Showtime At The Apollo revival, which is being shot at the Apollo Theater in New York, of course. Harvey recently relocated his syndicated morning radio show, heard locally on WVAZ-FM, from Atlanta to L.A., and lobbied hard to move his daytime talk show to the same place after five seasons in Chicago. Despite Feud’s departure, many television projects continue to shoot in Georgia and in the Atlanta area, including daily strip Lauren Lake’s Paternity Court, FX’s Atlanta, AMC’s The Walking Dead, and The Real Housewives of Atlanta. But the number is starting to dwindle a bit, with the recent cancellations of Teen Wolf and Devious Maids, which ironically, was set in Los Angeles. It is not known how much the shift from Atlanta to Los Angeles would increase the budget for the syndicated Feud, but when a host like Steve Harvey has this much clout, even tax credits don’t seem to have an impact.